FitBug has undergone some massive renovations in recent times, moving from a fairly standard weight loss system, to a tech-happy set of tools and devices which help you to track, monitor and analyse your progress. The site focuses on 3 key tools (the WOW, Orb and Go), each of which can communicate with other devices to build an accurate picture of your activities during the day and night. Essentially these devices are smart scales and pedometers. The software, accessible through the site, keeps records and allows you to view your steps each day or over time. You can also record what you’ve been eating, checking whether you’re burning off more calories than you take in. This isn’t revolutionary as a theory, but the technology makes it that bit easier and more precise. Of course, technology doesn’t come for free. Each device is around $50, which isn’t bad but also seems a little unnecessary when you can pick up a decent pedometer for a few dollars. The difference here is that the data is transmitted and stored in a collective bank, so you can update it regularly and instantly, whenever you have a device with you. The software then recommends whether you need to do more walking or running to stay in a weight-loss zone. The site itself is very attractive and modern-looking, but somewhat confusing. We weren’t sure whether they still offered membership deals until we checked their FAQ, where they only gave us information on how to renew membership. From what we understand, when you purchase a device you also become a member and can access the online tools, but if you want more information regarding this then please contact the sales team to find out more. There are a few recipes and articles in the Fit Living section of the site (which is a bit hidden away). The variety is okay, but not particularly extensive compared with other weight loss and dieting websites. The FitLiving element also suggests that community features will be implemented soon, so watch that space. 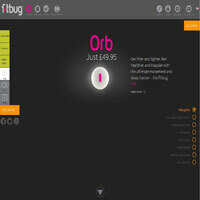 Whilst we weren’t completely convinced that the technology and software from Fitbug.com would make a lot of difference to a lot of people, if you’re looking for some smart tools to help monitor your weight and activity, there are options here. The devices are affordable, but it’s wise to check that they will all work with your android phone, tablets and other devices, before spending too much.